Building on the momentum of women’s boxing in the current era of pugilism, the exciting Seniesa “Super Bad” Estrada (11-0, 2 KOs) will headline the highly anticipated March 16 return of LA FIGHT CLUB in an eight-round flyweight fight against Sonia Osorio (8-5-1, 1 KO) at the Belasco Theater in Downtown Los Angeles, Calif. and televised live on EstrellaTV’s Boxeo Estelar. Estrada is a flyweight prospect who signed with Golden Boy Promotions in January of this year. The native of East Los Angeles, Calif. earned multiple titles as an amateur boxer before turning professional in 2011. Since then, the 24-year-old has developed into one of the biggest names in women’s boxing, fighting on important cards in the Los Angeles area, including an edition of LA FIGHT CLUB in 2016. Osorio, a student of the Mexican school of boxing, has only been in tough fights in her career. 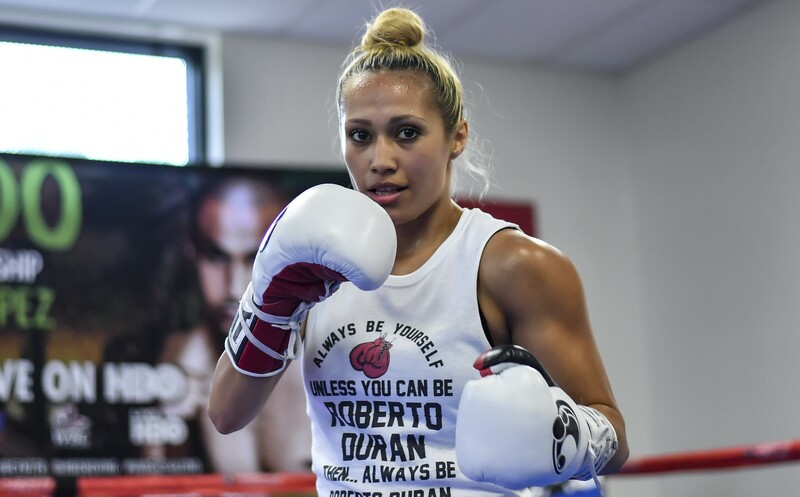 The 25-year-old is coming off a unanimous decision victory win longtime veteran Noemi Bosques, and she is fearless in her attempt to ruin Estrada’s coming out party in her own territory. Oscar Duarte (12-0-1, 8 KOs), the lightweight prospect of Parral, Mexico, will return in the co-main event in a six-round fight. Duarte will return after a spectacular fourth-round stoppage victory against Juan Jose Montes in October of last year. Jousce “Tito” Gonzalez (6-0, 6 KOs) will open the Boxeo Estelar telecast in a six-round fight in the 130-pound division. Gonzalez is a hard-hitting puncher who will look to retain his 100% knockout ratio in his first fight as an official member of the Golden Boy Promotions stable. Super Lightweight contender Antonio “Relentless” Orozco (26-0, 17 KOs) of San Diego, Calif. will make his highly anticipated return in an eight-round super lightweight fight. Newly-signed prospect Blair Cobbs (7-0, 5 KOs) of Las Vegas, Nevada will open the night of action in a six-round bout in the welterweight division. Opponents for this exciting card will be announced shortly. Estrada vs. Osorio is an eight-round flyweight fight presented by Golden Boy Promotions. The event is sponsored by Tecate “THE OFFICIAL BEER OF BOXING” and Casa Mexico Tequila. The Boxeo Estelar broadcast will air live on EstrellaTV at 10:00 p.m. ET/7:00 p.m. PT. The card will also stream live on EstrellaTV.com and on YouTube via LBI Media, Inc.’s Fenomeno Studios. Mark your calendars and buy your tickets for the upcoming shows on April 6, June 1, July 6, Aug. 10, and Oct. 12.